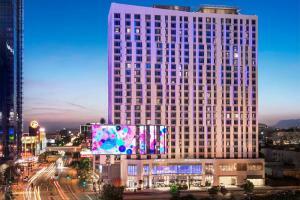 The Residence Inn LA Live is an oasis of calm amid the buzz and bustle of L.A. Live. Spacious and modern suites with separate living and sleeping areas create a perfect home away from home. Fully equipped kitchens with full-sized refrigerators mean that late-night snacks or home-cooked meals are easily at hand. Get your day off to a great start with the complimentary hot breakfast buffet. Relax and unwind year-round at the rooftop heated pool, or strengthen your body and soul and the fitness center. Located 16 miles from both Burbank Bob Hope Airport and Los Angeles International Airport. The Staples Center and L.A. Live entertainment complex are just a short walk from the hotel.